For a time in your career as a hard-working IT professional you are likely to come across a state of affairs in which an Exchange 2016 Server has completely failed and this situation can’t let you access more on the stored emails of server. So, handle all these redundant situation by bring into play this SysInspire exchange 2016 recovery Software that also known as Exchange 2016 Recovery Software in amongst users heart for fixing and repair exchange 2016 mailbox and recover emails from exchange 2016 to PST Outlook file. It effectively works on 2016 Exchange database file for repairing and conversion its data into Outlook PST File. Preview the complete 2016 exchange mailbox items like- emails, calendars, task, notes, inbox items, journals and users mailboxes items. Helps users recover emails from exchange 2016 priv1.edb file and pub1.edb file to PST Outlook file. Supports MS Outlook & Exchange Server Versions included- 2016, 2013, 2010, 2007 & below versions. Perform fast exchange 2016 mail recovery & exchange 2016 mailbox recovery process in front of users. SysInspire always care about their precious clients and for specially behalf on their demand the company has released exchange 2016 recovery Software for users who has been looking for 2016 free exchange recovery software for long. 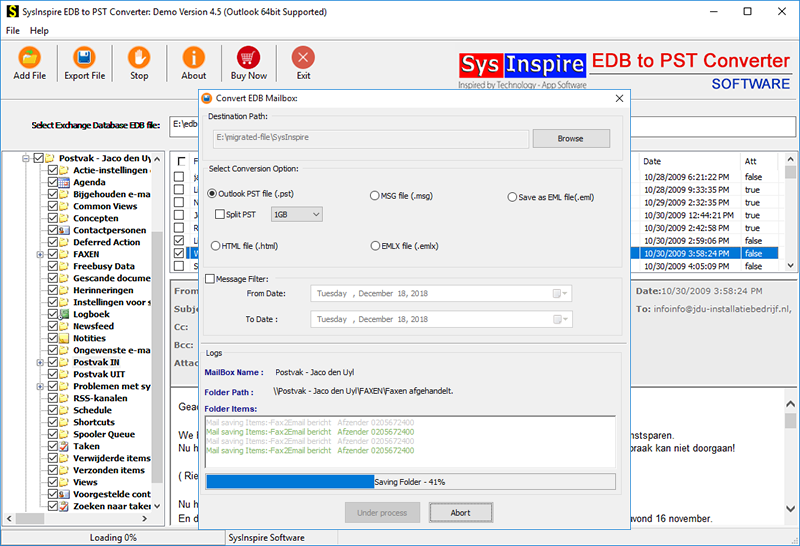 Download EDB to PST software quickly removes the presented errors of 2016 exchange EDB file and successfully recover emails from Exchange 2016 EDB recovery outlook file. Graphical user interface is too simple, a non-technical person can very easily handle software functionality without face any difficulty. Exchange 2016 Mailbox recovery software will let users repair exchange 2016 mailbox and convert them into PST, MSG, EML, EMLX and MBOX format with conserve folders structure, emails formatting and properties- to, bcc, cc, time, subjects and from etc. 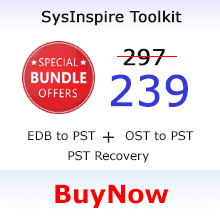 SysInspire exchange 2016 recovery is the powerful tool that provides very easy steps to recover emails from exchange 2016 and also convert the database of exchange EDB file to PST Outlook file with emails and attachments. It performs fast exchange 2016 mailbox recovery process without creating problem. Exchange 2016 Mailbox recovery software capable to handle selective items recovery. It means you can make section of the mailboxes, folders and emails that require recovering exchange 2016 mailbox and repair emails exchange 2016 to PST Outlook file with preserve data integrity in less time. At the time of Exchange 2016 Mail Recovery, the software maintains/ uploads all Exchange database mailbox folders and emails. It never make changes in emails formatting, emails attachments, emails properties- to, bcc, cc, time, subjects and from. 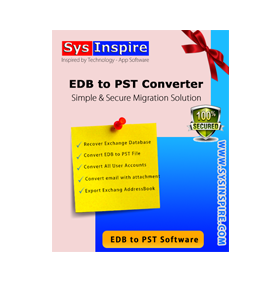 It keeps data integrity while Exchange 2016 EDB to PST. Exchange 2016 recovery software is helpful all users can use it to repair exchange 2016 mailbox and recover the mailboxes folders emails from priv1.edb file and pub1.edb file with emails, calendars, task, notes, journals and other users’ mailboxes. It never create problem while recover emails from exchange 2016. 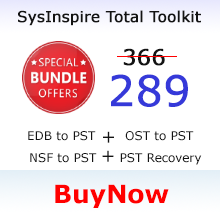 SysInspire exchange 2016 recovery software quickly removes all presented errors from exchange file, repair exchange 2016 mailboxes and also doing 2016 exchange mailbox recovery to PST, MSG, EML, EMLX and MBOX format without generate any problem . 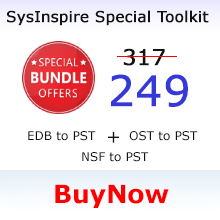 It supports any size of EDB file for recovery and conversion. Exchange 2016 EDB Recovery is one of the great programs that quickly generate the preview of exchange recovery process. It generates Exchange emails, calendars, task, notes, inbox items, journals and other user’s mailboxes. By getting preview you will come to know what items are going to convert from exchange. 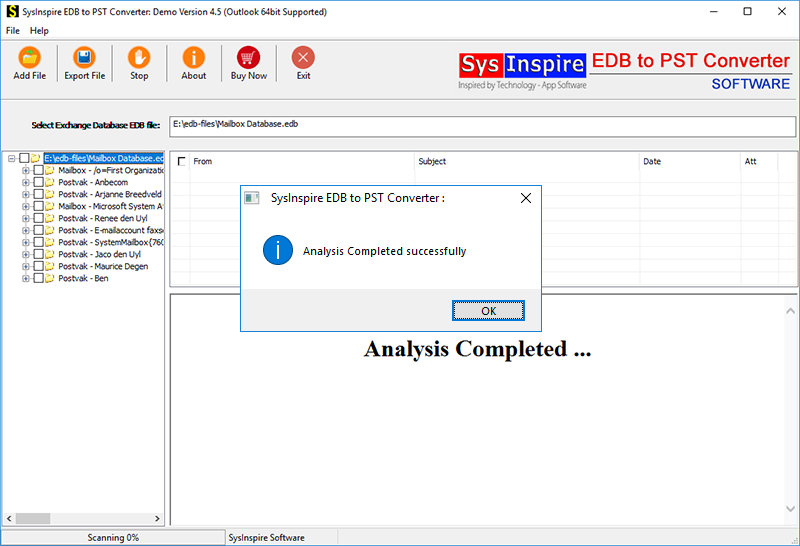 Supoprted EDB Version: SysInspire EDB to PST Conversion Software supports all version of Exchange EDB file including EDB 2016, 2013, 2010, 2007, 2003 and 2000 files. Do I require configuring MS Outlook on machine to use exchange 2016 recovery Software? No, with updated version of the Exchange 2016 EDB Recovery Software now you can successfully recover exchange emails from 2016 to PST File without installing MS Outlook on machine. Can I recover exchange 2016 mailbox from corruption using Software? Yes, this Exchange 2016 Mailbox Recovery Software is capable to repair exchange 2016 mailbox and making best exchange 2016 mail recovery. Can I convert selective mailboxes and emails of exchange 2016 EDB to PST Outlook file? Yes, this exchange 2016 recovery Software allows users convert all and selective folders from EDB file with preserve data to PST Outlook file. How many formats do Exchange 2016 Email Recovery Software provides for conversion? Exchange 2016 recovery Software provides 5 different formats PST, MSG, EML, MBOX and EMLX to recover emails exchange 2016. 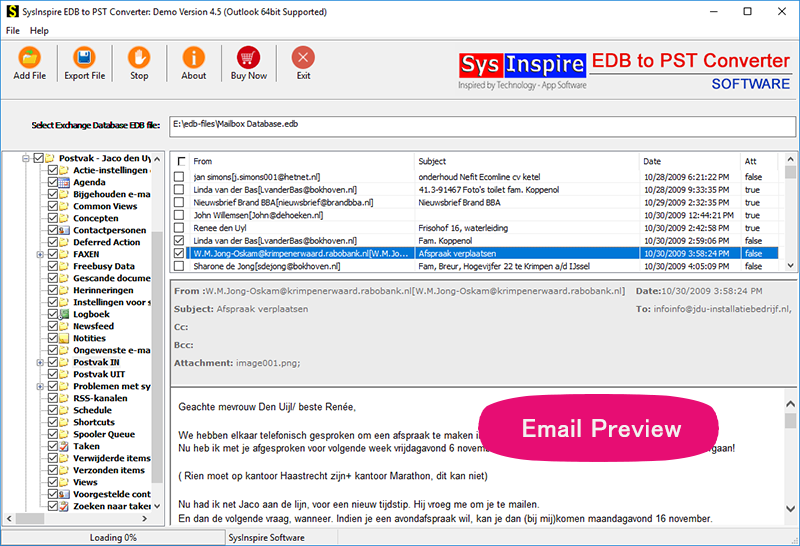 Is there any EDB Mailbox size limitation to perform conversion? No, there is no size limitation is provided by software. You can add any size of EBD file for doing conversion.